You walk into a jeweler and as luck would have it, they’re having a SALE! A sale at a jewelry store? But here’s what’s funny… They’re always having a sale. If you come back in a month or two, viola, they’re having another huge sale! If you fall for such a thing, you’ll see, this is what the jewelry industry has become; discounts, sales, promotions, clearance tags, half-off sales, blue-light specials, markdowns, inventory reductions, blowouts… WHEW! In fact, you could practically walk into ANY jeweler, ANYTIME, and they will ALWAYS be able to give you special liquidation sale prices. It’s mind boggling to say the least. And the truth is, a lot of jewelers have non-stop sales; every month, month after month. And most jewelry stores are willing to go 30-40% off retail all the time. It’s no big deal, it’s just normal business. But here’s the catch; Jewelers “discount” all the time, because people don’t want to purchase jewelry at full price anymore. I don’t know how, or why this all began, but people simply WILL NOT pay full retail price for jewelry ever. People want to feel like they’re getting a deal, especially on luxury items. Is it because jewelry is expensive? It could be because it’s a want and not a need. Or maybe it’s just because people don’t trust jewelers anymore. People feel like jewelers are ripping them off. So unless they get a deep discount, they won’t buy! I think in the last 20 years, I’ve probably only sold a hand full of items at full retail price (Pronounced FOOL!) I mean come on, I wouldn’t pay full price, would you? You’ll be in a much better frame of mind for buying that way. So what is considered a GOOD DISCOUNT SALE PRICE? I can live with those kind of sales. Some jewelers jack up the price to accommodate those deep sale prices. It turns out, you may not be getting that great of a deal after all. I’ve seen it happen… It ain’t pretty! I’ve also seen stores sell things at half-off… But they sell those things at half-off EVERY SINGLE DAY OF THE YEAR! No lie! 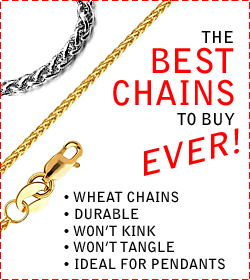 One particular company had gold chains half-off every day for ten years! So just know, that there’s a lot of fraud , or misleading sale prices out there. You have to proceed carefully and do a lot of shopping and comparing to see what’s a sale, and what’s not. That way you won’t get suckered into those so called deals. You’ll also be able to determine which jewelers are marking their prices ridiculously high. Avoid the jewelers that gouge the public! Not all “SALES” are fake. Some markdowns are real and legit. Often the stuff that jewelers mark down (50-60-80% off), are marked down for a reason. Old inventory that’s been sitting around for years gets discounted and dumped. 10kt gold usually gets discounted too. It could be a stone with a small chip in the side (like dented appliances). Jewelers normally don’t sell low if they don’t have to. Absolutely not! I’m not saying there are not REAL sales out there in the jewelry industry. I’m just saying that people expect a sale, and jewelers are going to give it. And if takes a jewelers red tag sale to do that, then by all means do so! But keep your eyes open, because some jewelers will take advantage of that fact and stick it to you. As long as you know going in, that not all sale prices are up to par, you’ll be just fine!